My first encounter with Coca-Cola's Life product left me confused. It's packaged in a green container which implies it's some kind of natural, ethical, environmentally-friendly product. What's more, Coke has spent over 100 years associating the brand with the colour red, so this seems a betrayal of the brand to suddenly go green. Essentially, it’s just a reduced calorie product that uses a more natural source of artificial sweetener, Stevia (instead of aspartame). Hardly a radical overhaul of the product as we are led to believe. And then along comes Pepsi’s True version in very similar packaging with similar claims. The poor consumer stands to be mightily confused, here we have two big drink companies using green to imply their drinks are what exactly? And as for their names, does Coke give you extra life? 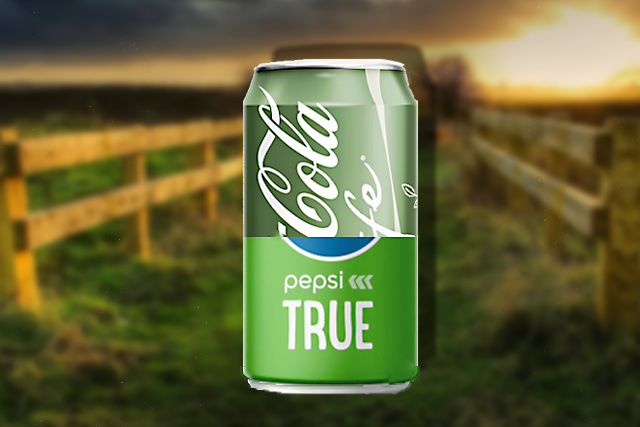 And what exactly is ‘true’ about the Pepsi’s product? At first you may think they are pushing some kind of new-found ethical ethos, but what both are trying to do is make their soda look like a natural and healthy product, which is pure spin. Coke Life may be less fattening than traditional Coke (27 calories instead of 42 calories per 100ml) but it’s a lot more fattening than Diet or Zero. Using a more natural sweetener doesn’t make it a healthier product, just less unhealthy. And how safe is Stevia in the public’s mind considering it was banned in the US in the 90s? So why have they both invested massively in this calorie compromise? In the US, unlike the UK, they are more suspicious of zero sugar or fat products, believing them to have too many chemicals substitutes, so Americans prefer mid calorie versions of foods and drinks. And it is this market they are both hoping to tap into and revitalise a decline in soda sales. Will these brands succeed or fail like Pepsi Next and Coke’s reformulated version? The problem of sending confusing messages to consumers is they tend to avoid brands rather than try to decode them. I bet both will get a packaging revamp within the year and I suspect that neither product will achieve the sales in the UK both brands are desperately hoping for, especially as the consumer has far more real healthy options like coconut water and green tea based drinks to choose from. Should Coke Life and other Stevia brands do more to educate consumers?